Proper functioning of the hips allows for pain-free walking, sitting and turning around. Active collaboration of hip joints, bones, cartilage, tendons and ligaments is required for smooth movement. This harmony, however, drifts away as hip joints become weakened or injured. Extra potent extracts from herbs contained in Maximum Cream create a synergic effect which is especially helpful in tackling hip joint pain. Our cream helps relieve pain from chronic diseases such as rheumatism, arthritis or osteoporosis. Our Maximum cream also helps with swelling and inflammation. 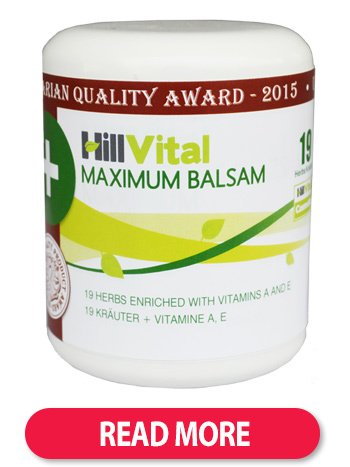 Maximum from HillVital has gained respectable reputation among our customers for treating hip and lower back pain. 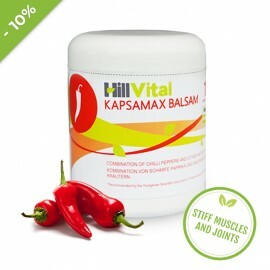 We recommend our Kapsamax Cream for the external treatment of aching hips and stiff joints and muscles. Kapsamax has warming properties that help to alleviate pain. The most effective method of applying our balsam is massaging it onto areas affected by arthritis, rheumatism or back ache. In the case of degenerative hip joint diseases, it is recommended to support your treatment with proper nourishment. 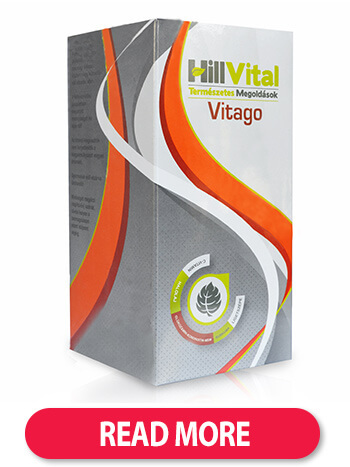 Vitago from HillVital is a complex vitamin pack that treats the affected areas by strengthening joints and muscles and helping them function properly. Active substances, vitamins and oils help relieve inflammation and have regenerating properties. They also suppress overall weakness of joints and muscles and speed up the healing process. Targeted nourishment of joints and cartilage is contained in our Glucosamine, MSM, Chondroitine pack. Active substances act together to renew joint functionality, relieve pain and regenerate cartilage. We recommend complementing your treatment with our herbal tea blend Tea GO . Our tea contains garden angelica, willow bark or famous stinging nettle that together create a unique combination suitable for helping with pain and inflammation. 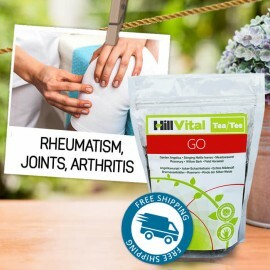 Infused with plant extracts, HillVital products for hip or joint pain help tackle pain, swelling, inflammation, and stiffness all the while improving joint health, mobility, flexibility, and strength. 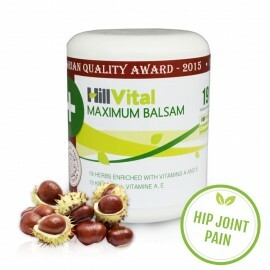 Maximum cream for hip pain (hip joint pain) Reduces inflammation. Helps the healing proces.. Maximum cream stifles hip pain, lower back and hip joint pain. Our cream with 19 herbal extracts reduces inflammation, stifles pain, speeds up the healing process and improves mobility. 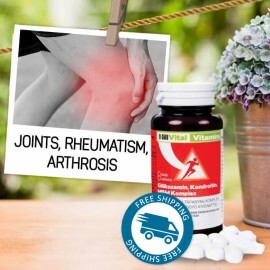 Glucosamine, MSM, Chondroitin - Dietary supplement Glucosamine is one of the natura..
For maximum nourishment and regeneration of joints, cartilage and musculoskeletal tissue. Helps improve the functioning of joints, relieve pain and inflammation, and assist in cartilage regeneration. Injury or sickness can develop hip pain in various ways. The most common pain is associated with osteoarthritis. More and more people nowadays suffer from rheumatoid arthritis, osteoporosis or osteonecrosis. What kind of diseases are these? Osteoarthritis: Osteoarthritis is a very common cause of hip pain. This degenerative joint disease causes joint cartilage decay. Damage or cartilage overuse leads to diminished or complete removal of the cartilage layer. Bone rubbing and intense pain are the result. Pain is often permanent and is not dependent on movement. Rheumatoid arthritis: This disease leads to synovial inflammation (outer layer of hip joints) which leads to pain and swelling. Osteoporosis: The hip bone is constantly pushed inwards while being renewed. If the renewal does not happen when the bone is being pushed inside, bones start to change their properties (density and weight decreases). Osteoporosis is the next stage. It weakens bones (hip joints) and increases the risk of fractures. Osteoporosis primarily affects older women. Osteonecrosis: Avascular necrosis or osteonecrosis is a disease that can follow a serious injury or broken hips. Osteonecrosis stimulates cartilage decay which hurts and leads to further complications. Koxarthrosis: Otherwise known as hip joint arthrosis, Koxarthrosis is a degenerative joint disease. It does not create inflammation but leads to overused and overburdened cartilage which can disappear altogether. Fractures: Fractures are defined by age, presence of other diseases and gender. These three factors stand behind a higher risk of fractures. Enthesopathy: Besides hip joint health issues, we should be also concerned about hip muscles. Enthesopathy is a disease associated with chronic muscle overload. Pain affects the quads, hamstrings and loins. In certain cases, it can also affect knees or lower belly. How to treat hip pain? In case of intense pains, try pain relievers. Make sure they have anti-inflammatory properties. Try cooling your joints. An icy compression effectively helps to alleviate intense hip joint and muscle pain. If you suffer from arthritis, try the opposite. Warm up your hips. Treat yourself to a hot bath or shower that will relieve your pain. Allow yourself to rest. Rest is a universal antidote and hip diseases and injuries are no exception. Avoid strenuous activities which can cause hip joint pain. We might not realise it, but our weight can also be a burden for the musculoskeletal system. being overweight not only burdens the body, but can also cause hip and joint pain. Next time you go shoe shopping, give preference to comfortable alternatives rather than aesthetic ones. Improper footwear can be another cause of joint pain. Do you cross your legs often? If you said yes, you not only complicate the flow of venous circulation (varicose veins) but this type of posture bends the joint in the wrong way. Try supportive equipment or a brace. They will make your life easier by eliminating hip joint pain and improving your mobility and stability. Alternative natural therapy effectively helps stifle hip joint pain. Consumption of C and D vitamins plays an important role in the production of collagen, cartilage and joint structural material. Some people turn to vitamin E which has antioxidant effects. Glucosamine and chondroitin also have beneficial effects. Willow bark: Commonly used herb to provide relief from pain. Ideal for long-term use. Anti-inflammatory effects. Arnica: Supports absorption of active ingredients deeply into the tissue. Helps with swelling and inflammation. Popular in fracture and injury treatments. Helps stifle hip joint pain. Ginger: Exceptional anti-inflammatory effects. Ginger extracts are also used in treating rheumatism, arthritis, hip joint, muscle and bone pain. Stinging Nettle: Popular in folk medicine with beneficial effects supported by scientific studies. Comfrey: Herb that heals bones and joints. Camphor: Traditional help in relieving hip joint and back pain caused by a cold. Also used in treating gout, rheumatism, arthritis and muscle inflammation.